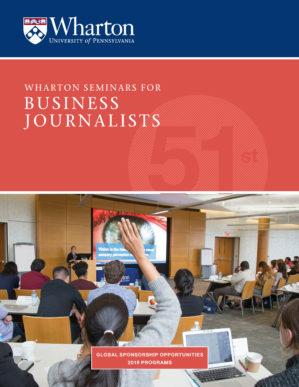 Fees paid by participating journalists cover only a portion of the cost of the Wharton Seminars for Business Journalists. The Wharton School and generous corporate and foundation sponsors underwrite honoraria for faculty as well as the costs of classroom facilities, materials, and meals. Association with world-renowned media outlets and the Wharton School. Representatives of participating companies are given recognition during the program and are the distinguished guests of honor at the “Sponsors’ Dinner,” held during the program. Organizations are given full recognition in promotional materials, including a link from the Seminars Web site. Contribution counts toward full participation in the Wharton Partnership Program. We invite you to support the program and become a sponsor. If you would like to learn more, please contact us directly at communications@wharton.upenn.edu or download the sponsorship brochure. Recognition in all Seminar publications, including the event app, the sponsorship brochure, Philadelphia dinner program booklet and the Seminars website. The option of submitting a quote relevant to business journalism from your company’s spokesperson for use either on our website or in our literature. The chance to send two representatives to attend any two sessions, as well as the cocktail reception and Sponsors’ Dinner. This is an excellent opportunity to network with journalists from top national and international news organizations. The option of exclusively hosting a luncheon during one of the programs where you can showcase your brand (on a first-come-first-serve basis). Recognition as members of the Wharton Partnership, which provides alliances with researchers, increased visibility on campus and a competitive recruiting edge. The potential for one of your executives to appear on SiriusXM Business Radio Powered by the Wharton School (Channel 132).